For the entire month of March, Outback Steakhouse is having a special Red, White and Bloomin' menu to help Outback Steakhouse in donating $1 million to Operation Homefront. For over 20 years, Outback employee volunteers have traveled to Iraq, Afghanistan, Turkey, Kuwait and aboard naval vessels to serve over 150,000 deployed men and women. My husband remembers what a treat it was year's ago when he was stationed in Afghanistan and Outback served bloomin' onions. 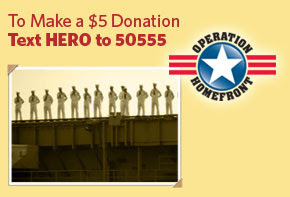 Operation Homefront helps out troops, wounded soldiers and families when they return from deployment. To learn more about it, go here.